On behalf of the entire team at Rahisisha Solutions, I wish you Merry Christmas & Happy New Year! Over the course of 2014, we've been getting numerous inquiries from our customers to be able to create forms of various types: contact forms, call back forms, reservation forms etc. I'm excited to announce that we've completed the development and have made it simple for you to capture information from your website visitors. The number of forms you can create varies depending on the plan you are on. To create a form, log into your Rahisisha Sites profile and navigate to Site > Forms > Add Form button on the right. The next step is to create fields by going to Site > Forms and clicking on the Field Settings icon next to your newly created form. Here you will be able to see a list of fields for your form. 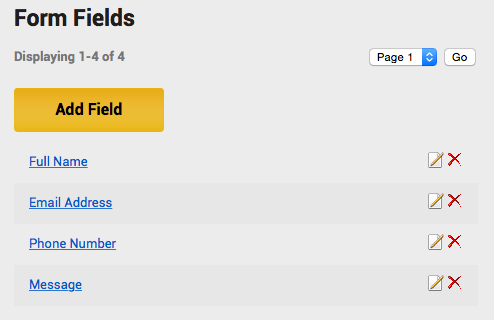 By default, there are no fields so you will have to create a new one by clicking on the Add Field button on the right. We support creating numerous field types depending on your requirements. 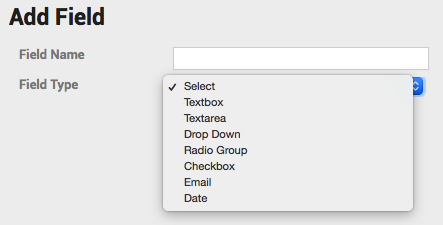 You can choose from a textbox, textarea, drop down, radio group, checkbox, email and date. Repeat the above process to create as many fields as you need. For a form that I just created, I have a field for Full Name, Email Address, Phone Number & Message. We are working on an easier way to publish your form and some form styles that you can select. At the moment, you need to add a certain code snippet on your page where you wish to display your form. Please contact us when you are ready to publish your form and we will assist you. Let us know of what you think of this feature in the comments below.